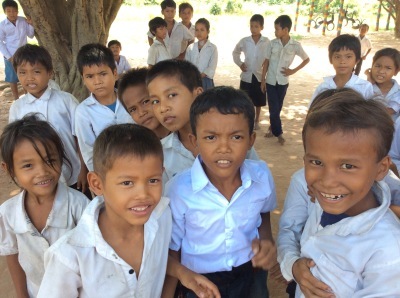 We have built five elementary schools in northwest Cambodia and adopted two more elementary schools. We support the education of over 2000 students a year. Our elementary schools are built with local labor and with materials bought locally, too. The concrete foundation and poured concrete floors of each school are raised above the customary flood plain with fill so they will stay dry during the rainy season. Each school has a large playground where we have planted shade trees. Girls and boys from first through sixth grade attend. Our first school was built in 2002 at Poum Steung, a farm village along both sides of a small river some 14 miles west of Siem Reap. Sarith’s brother, Pran, who lived nearby, selected this site because it was the neediest village in the area. Children from that village had very poor school attendance. The nearest school was 5 km away, across the highway traveled by heavy trucks going to and from Thailand. The village was strongly behind the project and it was completed on time and within budget (left). 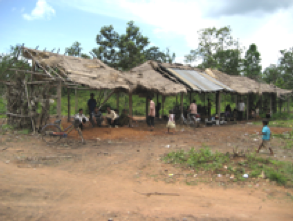 Our second school, Kouy school, is 45 miles north of Siem Reap, in a remote forested area 5 km. off the highway. 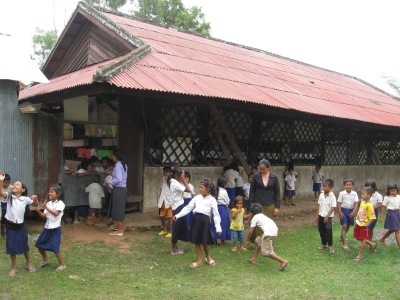 This is a school for children of the Kouy tribal people, a separate ethnic group, which was decimated by the Khmer Rouge. The government has given them this remote land and Kouy families are coming there from all over the country to build homes and start small farms. Meetings were held to discuss the new school with the Kouy mayor. A major concern was preserving the Kouy culture. We funded teacher training for several Kouy adults who now teach in their school. Again the project went well. As we did at Poum Steung, we also put in a village well. And, as with our first school, attendance has been outstanding. 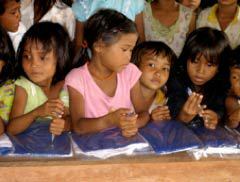 As a separate and impoverished minority, many of the Kouy children had not attended school before. On the left are a few Kouy students who had never before owned a pen, leaning on their new school uniforms and checking out their school supplies. Our third school was enabled by an anonymous gift from a member of Resurrection Catholic Church in Rochester, MN. This was built in 2006 in the Cambodian town, Srai Pou, near the Kouy school. The existing school (left) had been a crude structure with large holes in the roof that could not be used in the rainy season and that couldn’t hold all the students who wanted to come. The need was so great that shortly after our school was finished (right), another new school was built right across the schoolyard from it by a European NGO. Now the children in this village of Srai Pou have two dry places to learn. Soon after our Srai Pou school was built, Sarith’s brother, Pran, became very ill and died. He had selected school sites and supervised construction for our first three schools. Our fourth school was built in his memory. It is in Sarith and Pran’s home village, Tampoung, 24 miles north of Siem Reap. Here you see the village welcoming Sarith at the school opening ceremony. The land for the school was donated by Sarith and Pran’s sister, Hong Ou, who still works the family farm. We also put in a well and started a garden. 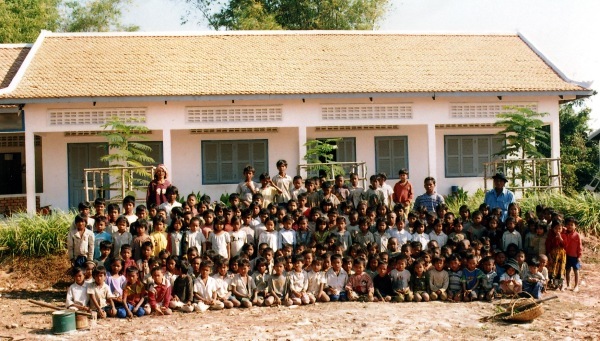 This school is built on the land where Sarith’s family home was burned down by the Khmer Rouge. It is satisfying to see this site be turned into a school, to help this village construct a building that expresses hope for the future on the ruins of their difficult past. Some coconut palms that Sarith planted as a child are still growing near the school.